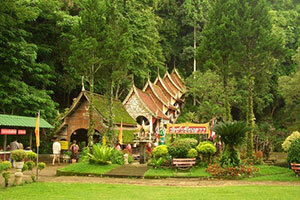 Wat Tham Chiang Dao is a charming cave located in Amphoe Chiang Dao. It is situated 72 kilometres from Chiang Mai town, turn left at the entrance route and proceed for 5 kilometres on an asphalt road. Convenient parking is available. Climb a staircase with a zinc roof to reach the cave. The lovely cave greets visitors with various kinds of fish swimming in a stream in front of the cave. Touring in and around Tham Chiang Dao with a local guide is possible by contacting local guides in front of the cave. A service fee is charged.